Cementitious Urethane has recently become one of the best floor coatings on the market. This floor coating was initially designed for the food and beverage industry to handle consistent contact with water and thermal changes in their facilities. Now that it has been discovered to work both in all kinds of commercial capacities more people than ever are using it! If you your flooring is going to come in frequent contact with water, this is the floor for you! Cementitious floor coating creates an impenetrable barrier between liquids and the base flooring. The application allows for a seamless finish which not only maintains the aesthetics of your business, but also has been proven to decrease collection of bacteria and other chemicals in the floor seams. Cementitious urethane is able to withstand huge temperature fluctuations and since it expands and contracts like concrete the risk of bending or cracking in the flooring is very low. 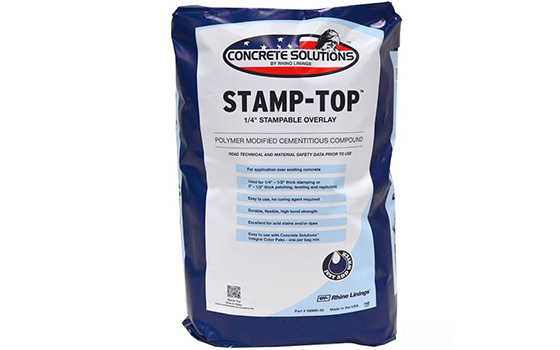 Stamp top ¼” Stampable Overlay is a “just add water”, polymer modified cementitious compound which can be applied over existing surfaces and stamped ¼” - ½” thick. It can also be used for patching, leveling and re-pitching applications from 0 -½” thick. Sold in 50 pound bags. 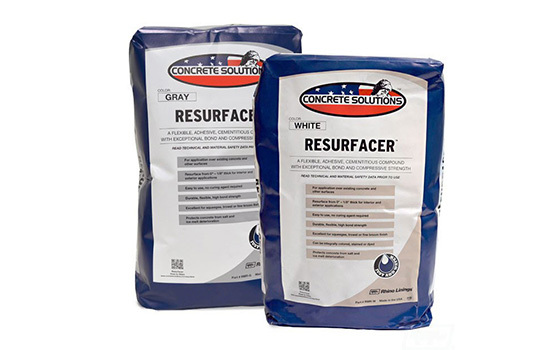 Resurfacer is a “just add water” resurfacing mix made with powder polymer, a mix of gray or white cement and 60 pound silica sand. The mix is sold and 45 pound bags. Can be used to apply a squeegee coat, broom finish and/or trowel knockdown spray texture. Coverage Rate: 150-250 sqft per 45-pound bag mix depending on applied thicknesses. 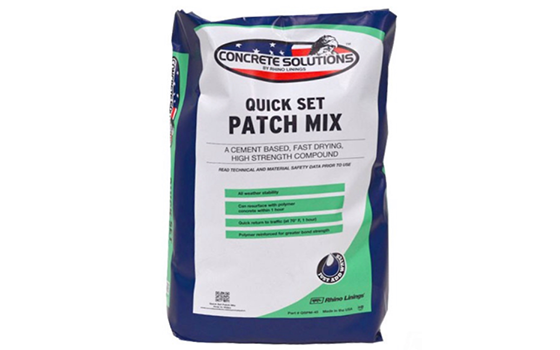 Concrete Solutions Quick Set Patch Mix is a “just add water” fast setting patch max for repairs from 0 to 2 inches thick sold in 50-pound bags. Trowel-Top polymer cement is a revolutionary product used to restore and recolor old, faded or stained stamped concrete to look like new. 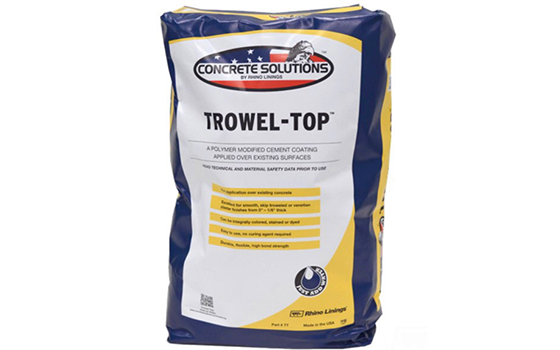 Trowel Top polymer cement can be troweled over existing concrete and other surfaces. 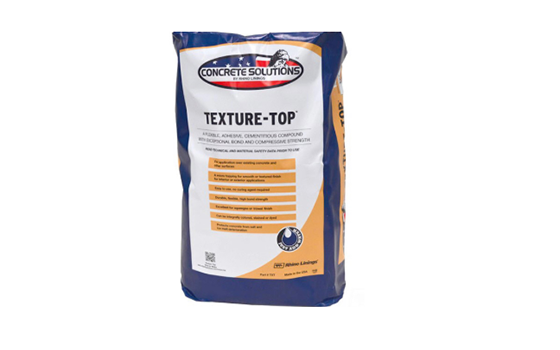 Concrete Solutions Stamp-Top polymer cement is ¼” inch ready stamping mix use for overlays or patching, leveling and re-pitching. Concrete Solutions Texture-Top is a polymer modified overlay designed to be sprayed or troweled to provide various textured finishes over concrete and other sound services. It is excellent for pool decks, walkways, driveways, patios and many more.